Are you ready for the Big Ride? It is spring in Cyprus and this is when Cyprus is at its best. A cool breeze, a bright-but-not-hot sun, green grass, wild flowers, a light drizzle – it is paradise out there. It’s time for the Cyprus Gran Fondo powered by Volkswagen! 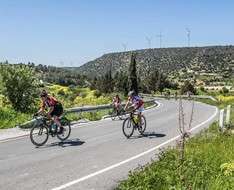 The Cyprus Gran Fondo is a 3-day Road "Cycling for All" event, which, since 2017, is featured among the biggest cycling events of the UCI as part of the Gran Fondo World Series for cyclists ranging from pros to beginners. The event provides the perfect opportunity for recreational riders to qualify for the World Gran Fondo Championships held every year. All participants of Cyprus Gran Fondo will have the opportunity to earn their qualification in the Gran Fondo World Championship. Starting every day next to the Mediterranean coast, you will climb some of the nicest mountains of the island and pass through traditional and rustic villages, and then return back to some of the best hotels in Pafos to enjoy your off-the-bike time!